Angie's 2 Cents: Half way there! This baby is half way done! I can't believe we are at 20 weeks already. I realize that the first 20 weeks are 'shorter' than the second 20 weeks because you don't even know you are pregnant until you are 4-5 weeks along....but still. I would say overall I am feeling pretty good. I definitely am still more tired than usual, but not like I was in the first trimester. I have noticed that my gums are quite swollen and bleed easily when I brush/floss them. I am going to the dentist for a cleaning near the end of May, I can only imagine how bloody that experience will be. Ugh! Seems like one of those things that no one ever told me about pregnancy. Not that it's a huge deal, it's just unpleasant when I am in the middle of doing something and can suddenly taste blood. Blech! My belly is continuing to grow some. 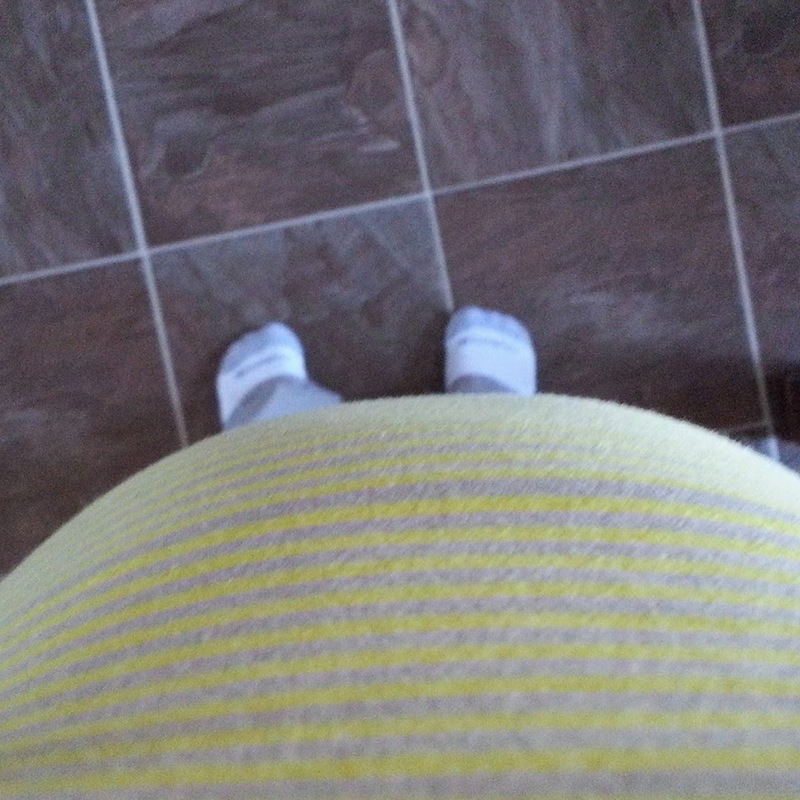 I have to say that I expected my belly would be a bit bigger by 20 weeks. I am not concerned that it's too small, because every woman is different, but I just would have expected it to be a bit bigger by this point. Someone was asking me the other day if I had any major cravings or food aversions. I haven't really had either. 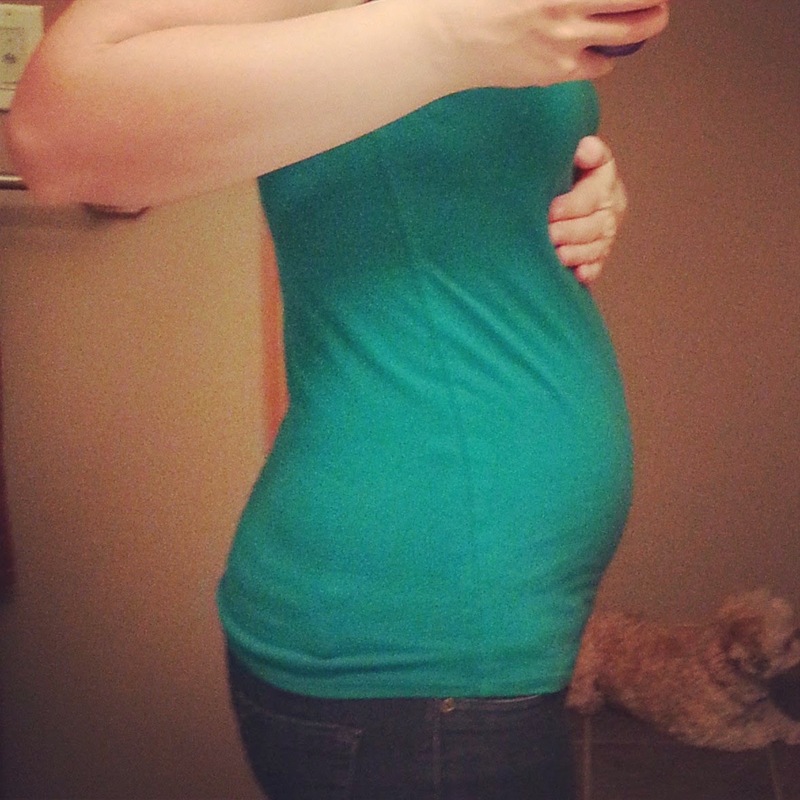 In the first trimester, the whole thought of food in general was a turn off. I could eat pretty much anything, and it tasted fine, but just don't ask me to think about what I want to eat for the next meal, because the thought of food made me queasy. Since then, I haven't really had an unusual aversions. As for cravings, I would say in general I have craved salty things more than sweet. I did have some cravings for dill pickles, and have eaten a couple of jars. I feel like I have eaten a lot of cheese. I feel like I get excited for certain types of food, and enjoy them when we have them, but there hasn't been any cravings that had to be satisfied immediately. There was a day when I wanted a cinnamon bun, so a few days later, when I went out, I went and had a cinnamon bun. I have craved fruit a lot. Unfortunately, being the time of year it is, our choices are a bit limited. However, I did enjoy some awesome oranges, apples, bananas, grapes and last week we had a really tasty mini watermelon. I can't wait until we can get more delicious watermelon! I have been noticing a bit more achiness in my back. I don't know what it is, but since I have been pregnant, I only seem to want to sleep on my back. So far, it feels okay, I haven't had any numbness or shortness of breath, but I expect as my belly grows it will get less comfortable. I have noticed in the last few days that if I do sleep on my back all night that I wake up with a really achy lower back. I do try to sleep on my side, and put a pillow between my knees, but 9 times out of 10 I wake up in the night, or in the morning on my back and the pillow is on the floor. I have also had a bit of SI joint pain, and I expect at some point I might have some chiropractic treatment for that to hopefully keep it from getting too painful. I do also feel my lower back a bit more when I am working. I am curious how long I will be able to work. I am hoping to work until mid-July, but we will play it by ear. If everything goes according to plan, I have been telling my clients that I should be able to work until the end of June for sure, and hopefully into July as well.